Selected from many of the world's great religious texts and spiritual teachings, the Green philosophy has a long standing tradition of ecological stewardship. Trees have long been sacred to people! Hinduism is the banyan tree representing fertility, love and life, and it is believed to be home to the holy trinity of Hindu gods (Brahma, Vishnu, Shiva). Buddha found enlightenment while meditating under the bodhi tree, and bodhi trees are found next to Buddhist temples through Asia. Mohammad was said to have compared a good Muslim to a palm tree, and stated that planting such a tree was a satisfactory substitute for alms. The Green Rule poster, which is produced and published by Faith and the Common Good, measures 21.5" x 27.5" in size and makes a nice companion to the Golden Rule poster. 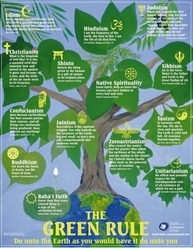 To support educators in using this poster, a Green Rule Poster Study Guide is available directly from Faith and the Common Good (click here).